Christians have had a strong devotion to the Blessed Virgin since the time of the apostles. Mary remains the ever-faithful handmaid of the Lord. Mary seeks not her own glory, but the glory of her Son. Mary was the earthly Mother of Jesus, chosen from all women. The Blessed Virgin, through the power of the Holy Spirit, became the Mother of the Son of God! Love and reverence for the Blessed Virgin, the Mother of Jesus, is a privilege and a duty. and by Mary’s appearances at Lourdes and Fatima. 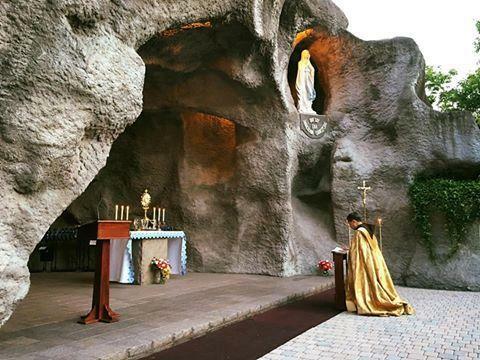 We call the Message of Lourdes the words that were exchanged between Virgin Mary and Bernadette Soubirous, at the Grotto of Massabielle, during the time of the eighteen apparitions. This message can be heard as: God is love and he loves us as we are.